Antonia's clean and simple creation is absolutely stunning and elegant. Plenty of white space allow the flowers to really stand out, and I really love her coloring of them. 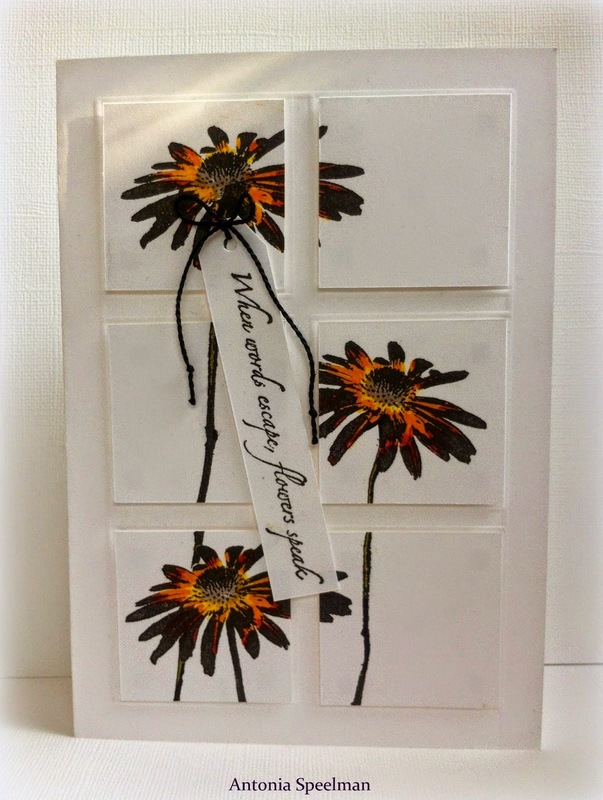 A simple, heartwarming sentiment finishes off this card beautifully. Congrats on being my Cut Above this week, Antonia! The awesome Mike Funke will be leaving us after this challenge, and on behalf of the entire Design Team, a big thank you to you Mike! You've been a pleasure to work with, and we appreciate all your hard work and wonderful creations. Big hugs to you! Be sure to tune in tomorrow when the wonderful Jaydee has a theme challenge for us! Oh my goodness! Thank you Joanne for choosing my snowman card!! Congrats to all the winners! Congrats to Antonia for her wonderful creation! Thanks to Andrea for choosing my card - how nice!! And thanks Laurie for choosing my googly-eyed tomatoes. I love you from my head to-ma-toes - LOL!! Congrats to all the Cut Above Winners. Such a fun group of paper players! Happy Weekend All! Thank you so much for choosing my card as this week headliner. And congratulations to all participants in this challenge, because all entries are beautiful!